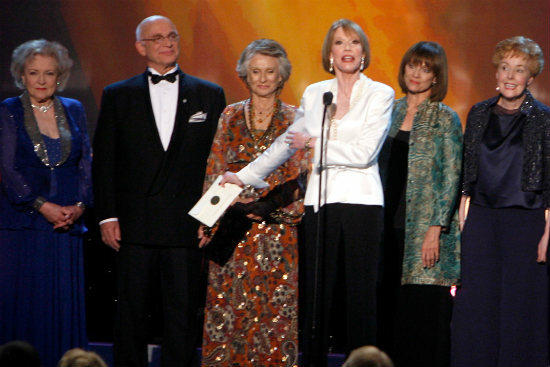 Women Of Mary Tyler Moore To Reunite - Joe.My.God. The five female cast members of the Mary Tyler Moore Show will reunite for the first time ever in an upcoming episode of Hot In Cleveland. In the Hot In Cleveland episode, which tapes April 5, I hear Elka (White) and Mamie Sue (Engel) decide to get their bowling team, named GLOB: The Gorgeous Ladies of Bowling, back together. They reunite with former team members Diane (Moore), Peg (Leachman) and Angie (Harper). The quintet had a falling-out after their championship season went to their heads. This is believed to be the first time the five former castmates will act in front of a camera since taping the MTM finale in 1977. It’s also Moore’s second visit to Cleveland — she previously played Elka’s cellmate in a Season 2 episode. Shows like The Mary Tyler Moore Show paved the way for female driven comedies like Hot In Cleveland. Hot In Cleveland, toplined by White, Valerie Bertinelli, Jane Leeves and Wendie Malick, returns for its summer season with a live episode June 19.